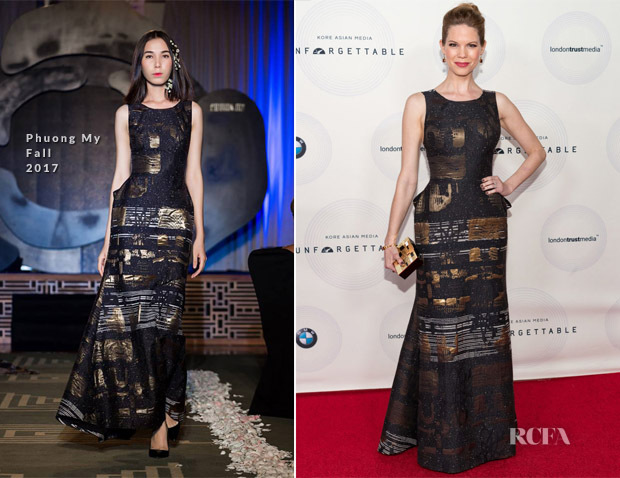 Actress Mariana Klaveno was at the 16th Annual Unforgettable Gala on Saturday (December 9) in Beverly Hills, California. Her Phuong My Fall 2017 gown presented a fully modern take on ladylike femininity, as what you cannot see from the nipped-in front is the sleek interpretation of a bustle in the back. However, it was the metallic mix of tapestry-like embroidery that added intrigue to the darker sophistication of the dress. A complementary Kilian clutch and classic bun completed the look that took on almost regal proportions.